I originally bought the single-speed to be a light and simple bike. My other bikes are heavy and utilitarian. I didn’t think I’d be commuting on the single-speed. 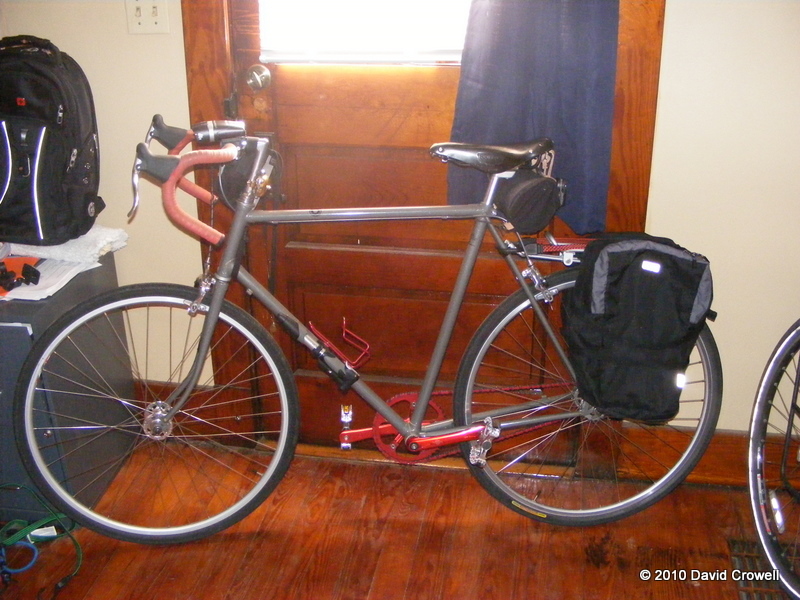 Once I had the bike, I found that I did commute on it, with a backpack. I dislike backpacks, so I’ve now added a rear rack to the bike. I bought a Mountain FeedBag from Tim. He had an extra due to a snafu with the seller. I mounted it to the bars. I had some smaller panniers that I put on the bike. I wanted to find some red ones that would fit, to keep with the theme of the bike, but I don’t want to spend the money now. The laptop barely fits, but it does indeed fit. I pulled an extra headlight off of the folding bike which I never seem to ride anymore. 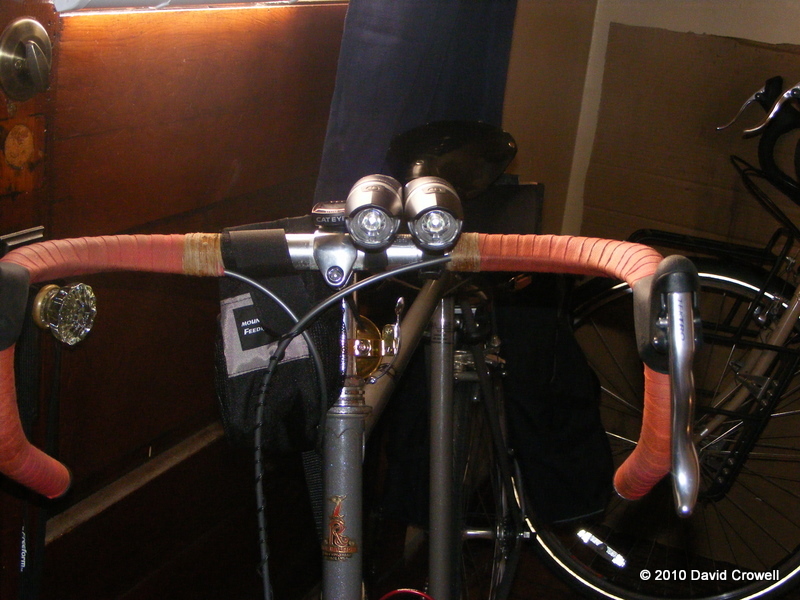 I put the light on the single-speed, so that I have two headlights. I don’t know if I leave it like that. We’ll see. I don’t have fenders on this bike, so it will likely remain a fair-weather commuter. There is the possibility I’ll add fenders at some point, but it wouldn’t make a good “snow bike” as the studded tires I already own wouldn’t fit well. My LHT will serve as “snow bike”. It looks good — far more useful for commuting now. I am really getting the single speed itch. Though if I were to get one, winter would be one of its explicit duties. The dual lights may look a little funny, but more light is better, I say! I use two headlights sometimes. Usually one that blinks and one solid one. I think two headlights are great. I use two sometimes, with one on each side of the stem. That way, I feel like people think I’m a motorcycle or something as compared to a light on someone’s mailbox. It also helps out with visibility because you can point one a little lower for potholes, and another a little higher for visibility and seeing things farther away. I don’t even think it looks silly. The two lights I have on this bike are more “be seen” lights. 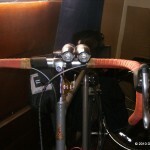 I have brighter lights on other bikes, but now that my commute is in the city, I don’t need quite as much light. When it’s light out I run both lights on flash. They make an eye-catching pair. 🙂 When it’s dark I’ll put at least one of them on steady. I’m also running two tail lights. I both headlights on one side of the stem. The other side has a small bag in the way. 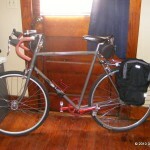 I commuted for the first time with the new rear rack and smaller panniers. Other than having to squeeze the laptop in, it worked well.